Our Factory-Trained Harley-Davidson® technicians are up to date with the latest technology and using our state of the art DYNOJET RESEARCH DYNO will perform a power run. A Dyno power run will let us know your bike’s torque and horse power across the rev range. In most cases we will also measure the air to fuel ratio (pending access to pre catalytic converter exhaust systems and certain exhaust systems that need modifications to check air fuel ratio). This information will be presented on a graph and illustrate how close your bike is tuned to optimum fuelling. This will give us a greater understanding of how your bike is currently performing and what it means to you as a rider. 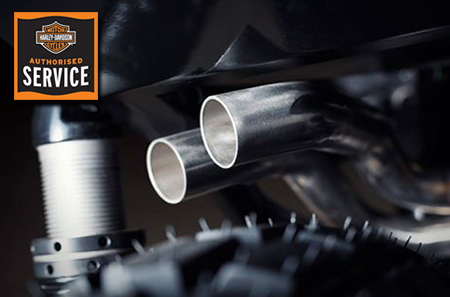 Our Harley-Davidson® technicians can discuss with you options for improvement or tailoring the performance to your riding needs. You are more than welcome to watch your pride and joy being run on the Dyno through the viewing window whilst enjoying a complimentary coffee.